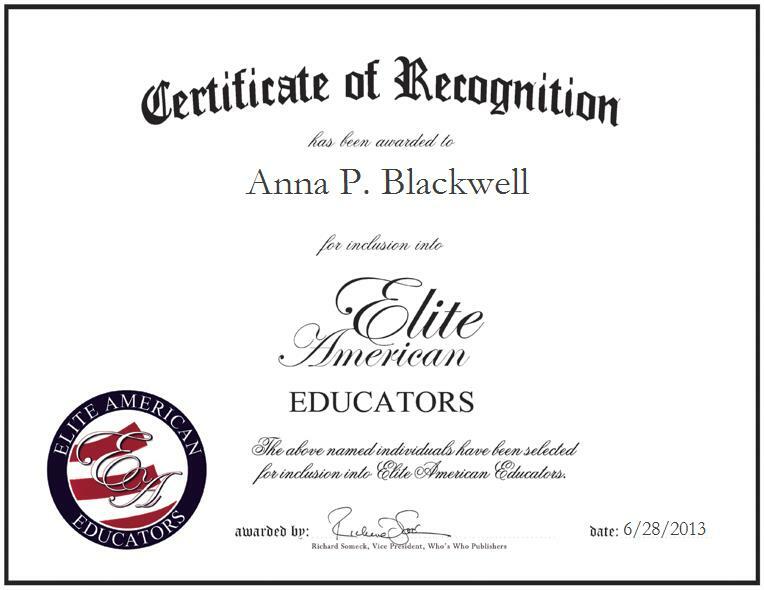 ← Suzan J. Waller, Ph.D.
BLACK MOUNTAIN, NC, June 28, 2013, Anna P. Blackwell, Anatomy and Physiology Teacher at Owen High School of Buncombe County Schools, has been recognized by Elite American Educators for dedication, achievements, and leadership in anatomy instruction. Lauded as an exemplary teacher, Ms. Blackwell demonstrates her passion for teaching and years of experience in her current role as an anatomy and physiology teacher by helping her students to learn and grow. She is in charge of teaching three classes per day for about an hour and a half each, and teaching freshman science, earth science, anatomy and physiology, and attending classes to implement changes. Ms. Blackwell has been a science teacher for 32 years, having spent 29 of these years at Owen High School. She also worked part time as a medical technologist clinical chemist for 27 years at a local hospital. She was able to offer students additional insight due to her hands-on experience, which other physiology teachers did not have. Ms. Blackwell has maintained a long-standing passion for teaching. As a child, she lined up dolls and pretended to teach them. Her mother was also a teacher. These factors played a major role in her becoming a teacher, and she has strived for excellence in her every endeavor since becoming an instructor of high school students in whom she hopes to instill strong continuous learning skills. Ms. Blackwell has garnered a reputation of distinction among her professional peers, including induction into Who’s Who Among American Women, Who’s Who Among American Teachers, and the Teacher of the Year Award from Owen High School in 2007.